Sometimes you’ll need some given digital outputs for some given inputs in your project. At least I do. There are several ways to do this, but I will use the Karnaugh mapping method. Let’s take an example. 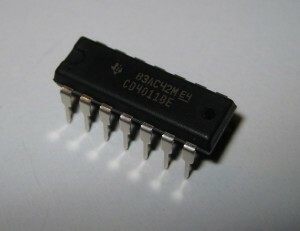 A H-bridge will take two inputs, direction and PWM-signal. We will have to convert those signals to the correct combination for the four MOSFET’s in the bridge. By doing this, we also assure that there will be no shoot-through, shorting the power supply by opening high side and low side at the same time. 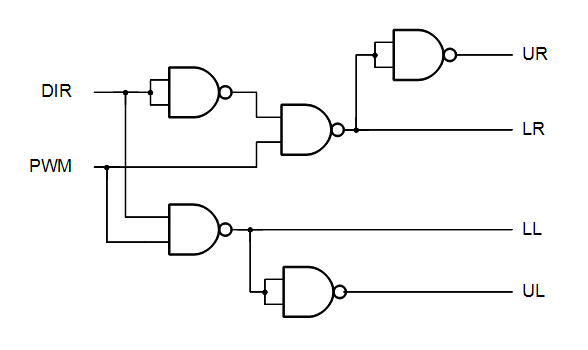 Next step will be to map the two inputs as a Karnaugh map. As you see we have to find groups or blocks of 1’s to get the simplest solution. 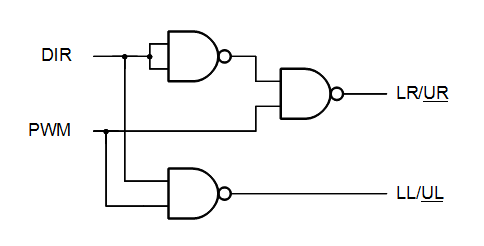 If the block goes over a whole row or column, the result is the signal that do not change. If it say 0, it should be the NOT variant of that signal. If the result is just a digit, its the AND of both signals. If you have to use two blocks to get all, put a + sign in between. In the LL table the upper block is DIR because it’s on the row DIR=0. In the LR table the lower block is DIR because it’s on the row DIR=1, and the left block is PWM because is located on the column where PWM=0. This is actually easy to see, from the two truth-tables UL and LL. LL is the inverse of UL. Complete H-bridge design will follow in some future blog entry. This entry was posted in Design and simulation. Bookmark the permalink.